Hike as much or as little as you like. When looking for hiking and kayaking opportunities deep into the Northern Georgia landscape, one has to consider the Chattooga River Trail in northeast Georgia. You'll follow along the Chattooga River for most of this 37.5 mile hike, and there will be ample opportunities to camp along the way. Some call this the waterfall trail, because you'll pass by 5 waterfalls if you hike the entire portion. Once on the trail, follow the bright green blazes throughout your hike. The southern trailhead at Hwy 76 is a good starting point. As you travel north, you will see and hear the Chattooga River flowing in the valley below. Along the way, look out for spectacular hemlock trees. After 10 miles of hiking, the Chattooga River Trail intersects and combines with the Bartram Trail. The trail then continues another 10 miles to the GA 28 bridge. About 3.7 miles after passing the bridge, the Bartram Trail branches off and the Chattooga River Trail joins with the Foothills Trail. It then parallels the river closely for another 6.7 miles to Burrell's Ford Campground and Burrell's Ford Road. At this section, the two trails split and come together again many times; a trail map is useful. 0.5 mile north of Burrell's Ford Road, the trail enters the Ellicott Rock Wilderness. Here the hiker must register if you want to continue. The Foothills Trail branches off to the east at this point and the Chattooga River Trail continues upstream to join with the East Fork Trail, another 2.1 miles. The final portion is a 1.7 mile stretch upstream where the Chattooga River Trail ends at Ellicott Rock. This is the intersection where Georgia, North Carolina, and South Carolina's boundaries meet. The total distance one-way is 37.5 miles, so use the campground to break up your hike into 2 or 3 days. Because of several different trail merges, be sure to keep on the green-blazed Chattooga River Trail. The Chattooga River has been named to the prestigious Wild and Scenic River System and serves as the boundary between Georgia and Southern Carolina. 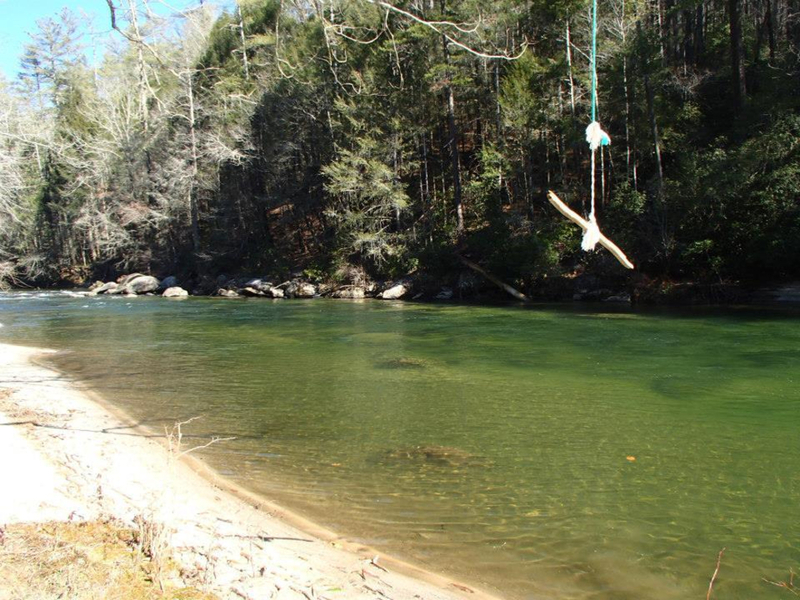 As a result of the minimal disturbance by man, the Chattooga River and its corridor provide a clean, litter-free hiking or rafting experience. You will probably see dozens of kayak enthusiasts shooting the whitewater during the summer months. And if you are interested in hiking and backpacking, the Chattooga River Trail offers some excellent views to enjoy the Georgia side of the river. Keep an eye out for 5 different sets of falls: (starting from southern trailhead in order): Lick Log Falls, Pig Pen Falls, Big Bend Falls, King Creek Falls and Spoonauger Falls. For camping, opt to stop at Burrell's Ford campground, around mile 30 if you're starting from the southern trailhead. The campground has a parking lot, so you can use the point as a spot to leave a car if you don't want to backpack. What makes this trail so attractive is the combination of activities. Whether it's backpacking the entire trail, or day hiking sections, you can opt to stop and camp at the northern or southern trailhead. 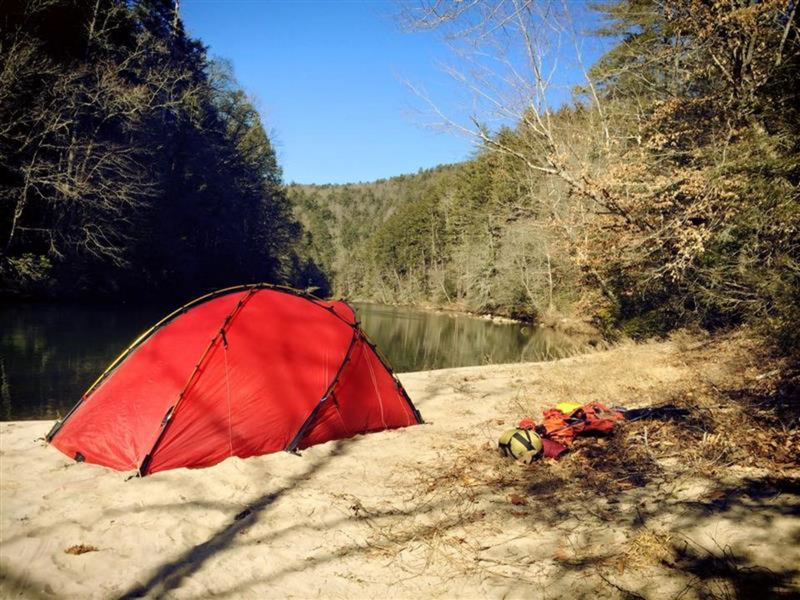 For kayakers, the trail follows along the Chattooga so it's easy to pull off and find a favorite camp spot along the sandy shore. The Chattooga River was designated a National Wild and Scenic River by Congress in May of 1974. As a result, no motorized vehicles are allowed within 0.25 miles of its banks. In addition, man-made facilities are minimal, consisting primarily of maintained hiking trails. Primitive toilet facilities and water are available at camping areas. The southern end trailhead of the Chattooga River Trail begins in Georgia. The parking area at the west end of the US 76 bridge. You can park here and walk across the bridge to the trail head. You can acces another parking lot at the GA 28 bridge if you wish to hike south to US 76. On the Georgia side, it is 37.5 miles from Hwy 76 in Georgia to Bad Creek and the border of North Carolina.